From before the twelfth century, and probably from before the Norman Conquest, the land which Low Nest Farm now occupies was part of the Manor of Derwentwater and Castlerigg and belonged to the de Derwentwater family. Little is known of the de Derwentwaters. 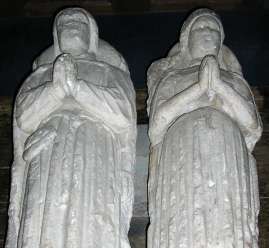 Effigies of some of them may be seen in Crosthwaite church. Although they had extensive estates elsewhere their principal residence was a castle or fortified manor house on Castlerigg, overlooking Derwentwater. This Castle is supposed to have been abandoned about 1470 and fell into ruins. An archaeological search in 2008 for the remains of the castle failed to find it but found instead the foundations of a large Roman fort. Possible locations of the Derwentwater Castle. The de Derwentwater dynasty ended for want of a male heir and in 1417 the estates passed to the Radclyffe family when Elizabeth, heiress of John de Derwentwater married Sir Nicholas Radclyffe, Sheriff of Cumberland. The Radclyffe's were an equally ancient and noble family originating from Radclyffe Tower in Lancshire before the twelfth century. The Radclyffes took over as Lords of the Manor and retained the name Derwentwater. The Derwentwater estates later expanded, with the marriage in about 1485 of Sir Edward Radclyffe, grandson of Sir Nicholas Radclyffe of Derwentwater, to Anne Cartington, heiress to the Cartington and Claxton estates in Northumberland including Cartington Castle and Dilston Hall. Dilston Hall became the seat of the Northumberland branch of the Radclyffes of Derwentwater in the mid 1500's.. The Derwentwater branch of the family built a new residence on Lords island in Derwentwater. Notable Derwentwater Radcliffes include Sir Richard Radcliffe who was knighted by Edward IV on the battlefield at Tewkesbury in 1471, became a trusted advisor to Richard III, was slain with him at Bosworth Field and was attainted by Henry VII. In 1688, six generations on from Sir Nicholas, Sir Francis Radclyffe was created Viscount Radclyffe and Earl of Derwentwater by James II. Sir Francis' grandson James Radclyffe, The third Earl of Derwentwater (1689-1716) was imprudent enough to take part in the Jacobite rebellion of 1715 and lost his head on Tower Hill. His estates (including Dilston Hall and the Manor of Castlerigg and Derwentwater) were attainted by the crown and subsequently given to Greenwich Hospital. Lord Derwentwater was held in high regard by his tenantry and is remembered in folklore. In 1832 Greenwich Hospital sold the Manor of Derwentwater to John Marshall Esq. of Leeds. Stained Glass window in Crosthwaite Church representing the coat of arms of Dame Alice Ratcliffe of Derwentwater. 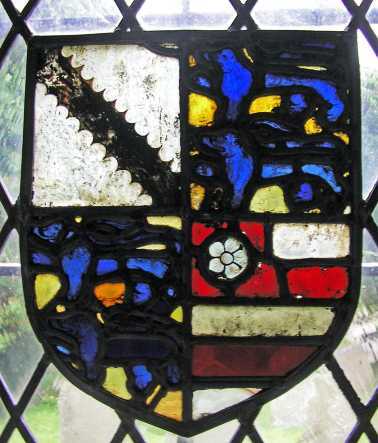 Top left: The arms of the Radclyffes: "Argent, a bend engrailed sable"
Bottom right The arms of the de Derwentwaters: "Argent, 2 bars gules, on a canton of the 2nd a cinquefoil of the 1st Ref 5"
Quadrants 2&3 The arms of de Someri of Dudley "Or, two lions passant in pale azure"
The de Someri arms come from Alice de Someri of Dudley Castle, Warwickshire, who married Sir John Ratcliffe about 1500. It may be supposed that Dame Alice commissioned the stained glass window after Sir John's death in 1527.Ref. 5. A bill or writ of attainder is an act of legislation which allows parliament or a monarch to declare a person guilty of some crime and have him executed Note 1 without the inconvenience of a trial. The property and estates and titles of a person who pleads guilty, or is found guilty of the said crime reverts to his Lord, or if he is himself a Lord, to the monarch. On the other hand, in the case of a person who dies beforehand (excluding suicide which is, de facto, a crime) or who elects not to plead and instead to suffer the horrific penalty of peine forte et dure, their property and titles are not forfeit. Greenwich Hospital was a hospital and charity for old sailors of the Royal Navy established by William III to satisfy, posthumously, the wishes of his wife Queen Mary II. The charter for the hospital was back-dated to 25 October 1694 so that it could be in the joint names of William and Mary. Mary died 28 December 1694 of smallpox at the age of 32. Some old maps such as James Clarke's map of 'The Roads, Lakes etc. Between Ambleside and Keswick" published in 1787 label the land to the south of the road into Keswick as 'Greenwich Hospital'. 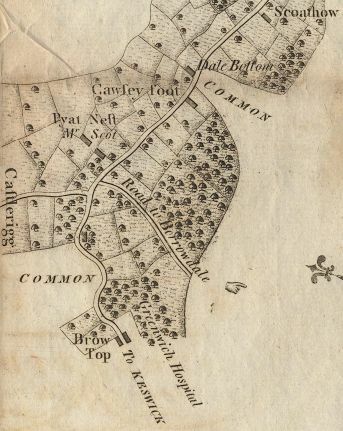 This same map shows Low Nest as 'Pyat Nest' and identifies the occupier as "Mr Scot". Jollies Cumberland Guide and Directory 1811 records as one of the principal residents of Keswick "Scott John, Steward for Greenwich Hospital, Piet Nest." Note 1 The justice system in medieval times had an admirable simplicity - essentially it was the ten commandments with a few minor additions such as treason. Everyone knew and concurred with the ten commandments - and the penalty for any transgression was death. ref 3 by public execution. This system had its merits in terms of transparency, deterrence and zero reoffending. In later centuries the penalty for very minor misdemeanours was commuted to transportation to the colonies, flogging or even the soft option of imprisonment, however the prisoners had to pay for their board and lodging. Part 1., Vol XII, Art. XIV.—Some Manorial Halls in the Vale of Derwent. By Michael W. Taylor, M.D., F.S.A. Ref 5 The History and Antiquities of the Counties of Westmorland and Cumberland, volume 2 by Joseph Nicholson Esq; and Richard Burn, LL.D. Printed forW.Strahan; and T. Cadell, in the strand. 1777. � copyright 2009-2015 :� Low Nest Farm.